Executives at RCL Foods must have debated long and hard before deciding to embark on their own version of radical transformation. But today’s numbers for the year to end June prove that decision enacted two years back that bigger is certainly not always better. Even in a deeply integrated organisation group like this one. The decision to substantially rationalise the group’s core Rainbow Chickens operations didn’t only require the courage to absorb a R200m knock on the bottom line. It also had a major impact elsewhere in the group where lower poultry volumes hit the ancillary Logistics and Animal Feeds units. Add in the challenge of a pedestrian economy and FY2018 was always going to be tough. But the results show a potentially treacherous path has been successfully navigated. And the group has established a platform from which to push ahead strongly. As for the details, the Chicken business rebounded so powerfully it was able to weather a potentially debilitating Listeriosis storm and still generate over R450m in EBITDA, around a quarter of the group’s total. As a bonus, the two divisions which previously relied heavily on Chicken volumes have themselves been successful in finding business elsewhere to replace the drop from within the group. Although the Chicken-driven turnaround was well telegraphed in recent financial reports, RCL’s numbers for the 12 months to end June still read impressively. Headline earnings per share jumped 52% on flat revenues; primarily because of a profit margin expansion from 7% to 8.4% at the EBITDA level. Management’s key number, Return on Capital Employed, is up from 4.8% to 8.1%. Better still, there is scope for another good year of profit growth. There’s a very real prospect for a strong rebound for the embattled Sugar division. And momentum is likely to continue in the Groceries and Chicken divisions which this year delivered half the group’s total EBITDA. The big story in this set of financials, however, is how this diverse food business is getting close to firing on all cylinders. It isn’t quite there yet. But is edging ever nearer. 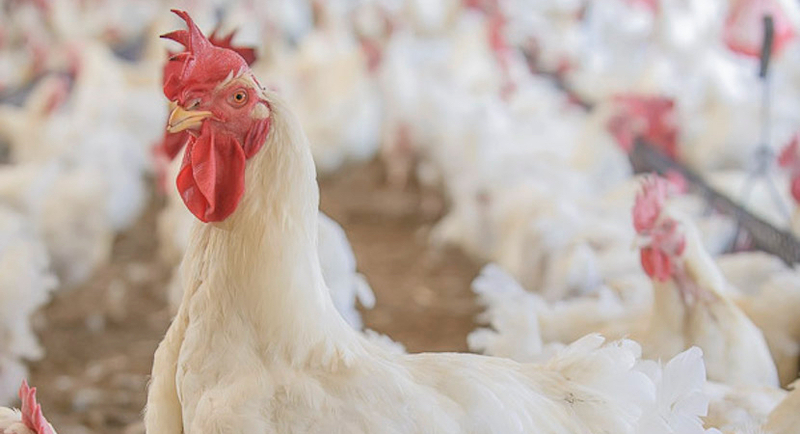 The turnaround in Chicken came via the strategy which saw the weekly number of birds delivered to the market falling to 3.4m from the previous financial year’s 4.8m. Greater efficiencies which were instilled during this “rightsizing” project has also created a resilience largely absent in the past. 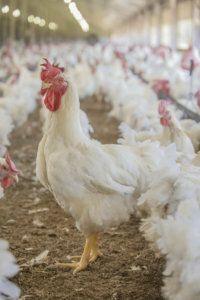 The poultry operations weathered sluggish consumer demand, continued dumping from abroad and an outbreak of Avian Flu which wiped out 5% of the breeding flock at a cost of R69m. The biggest challenge of all, however, came in the form of a high profile Listeriosis Crisis, sparked by contaminated Tiger Brands polonies. Dealing with it cost RCL R158m, split evenly between product recalls and lost production. RCL’s Wolwehoek meat processing plant emerged unscathed from the Listeriosis crisis. Investigations by the authorities found no trace of the killer ST6 strain at the plant. Even so, the directors say because of the public hysteria a job has to be done in re-establishing confidence in Rainbow-branded processed meat products. And to be sure it won’t go through the same stresses in future, RCL installed “a raft of additional safety measures over and above international standards” at Wolwehoek. Given the Chicken division’s newfound resilience, shareholders will be looking for a recovery in the Sugar division in the year ahead. Sugar was RCL’s major laggard in FY2018, falling from top to fourth in the ranking of contributing units after a 44% slump in operating profit. The reverse comes on the back of two domestic price decreases, totalling a chunky 20%, as government converted sugar pricing to an export parity pricing. The impact of low global sugar prices, the stronger rand and dumped imports more than offset a 36% post-drought production volume surge. Earlier this month the South African government updated a Dollar-Based Reference Price for the domestic market which, RCL says, “will provide the local market with additional protection from imports.” It’s a moving feast, and there are imported stockpiles which need to be worked through the system. But the promise of a rebound in the Sugar division’s bottom line for FY2019 is very real. 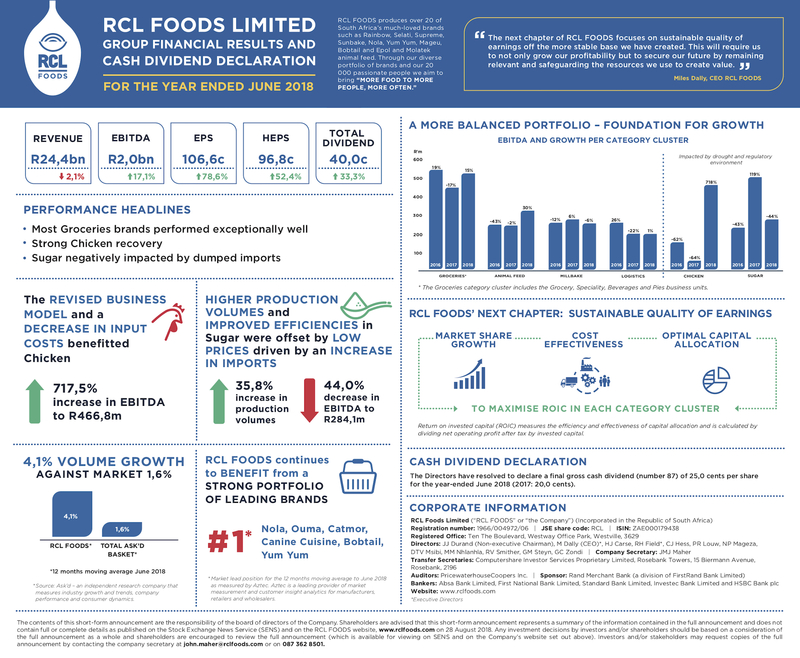 RCL’s highest contributing unit this year was the Groceries division where a brand-focused strategy continues to pay off. 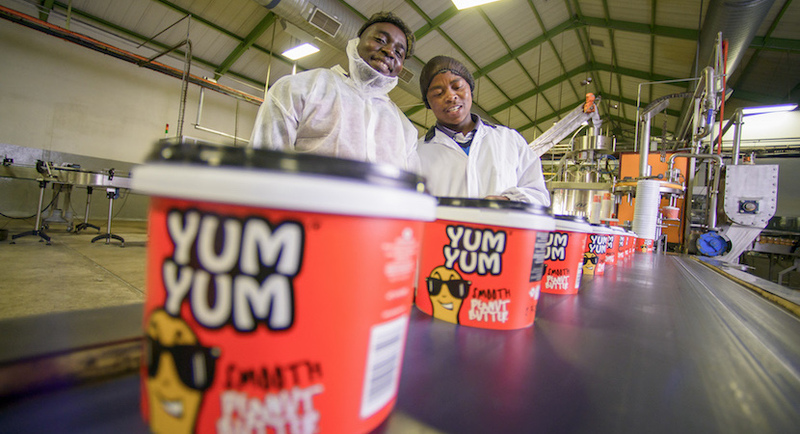 Its Nola margarine, Yum Yum peanut butter, Canine Cuisine and Catmor cat food becoming market leaders in their categories for the first time, joining Bobtail and Ouma’s Rusks which consolidated their Number One positions. Given those names, it’s no surprise that the company notes that Pet Foods was a highlight, buoyed by the opening of a new R136m production facility. More generally within the Groceries division, market share expansion continued with the basket of RCL products growing 4.1% in the year compared with the overall market’s growth of 1.6. With Chicken’s restructuring now completed, management has turned its attention to a couple of other sore thumbs. In the commentary to the results, RCL tells us it has now replaced the leadership in its under-performing Baking operations. And it is to close the sizeable prepared food operations in Bronkhorstspruit, ending its loss-making production of sandwiches, salads and pizzas. RCL shareholders are a hardy lot, having seen considerable volatility in a share price that in the past five years has fallen from around the current level of R17 in 2013 to a low of R11.50 and back again. Upside from this level, in the short-term at least, is largely dependent on how quickly the Sugar division’s profit can rebound to more normal levels. The declaration of a final dividend of 25c a share (2017: 20c) takes the full year’s pay-out to a 33% better 40cps from 52% higher headline earnings of 96.8cps. That puts the stock on a historic price:earnings ratio of 17.5 times and dividend yield of 2.3%. Despite these elevated ratings, as the shares are trading where they were five years ago, a streamlined RCL is sure to have its fans. Doubtless led by those looking to switch from the sector’s market leader Tiger Brands, which has blotted its copybook.